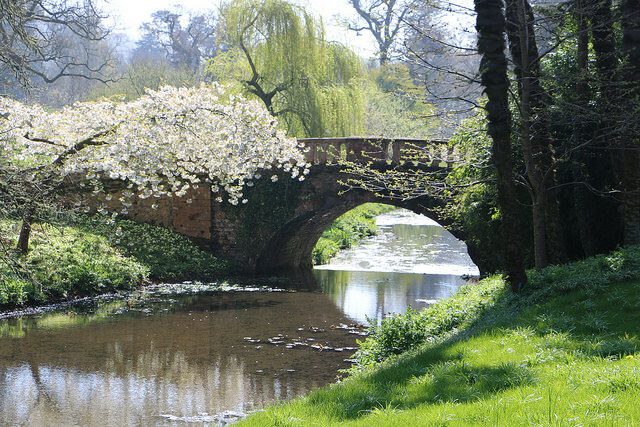 Lovers of history and gardens will enjoy this journey from the sea to the home of a historic seafarer, in the north of the county. This journey include a visit to the mysterious (and slightly rude) Cerne Abbas giant, the delightful Minterne Gardens and the house near Sherborne built by famous explorer Sir Walter Raleigh. The Cerne Abbas giant is visible 24/7, every day of the year and you can view it for free. 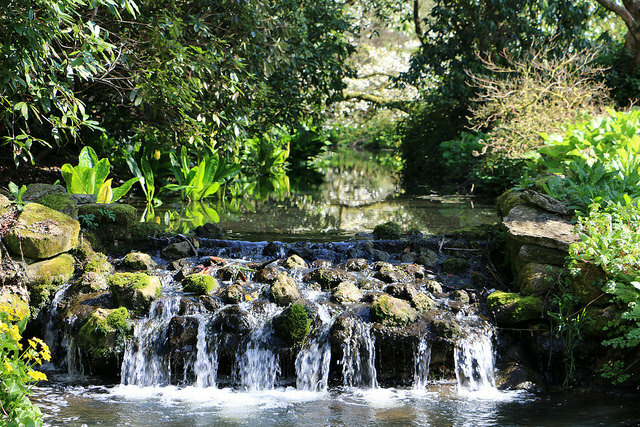 Minterne Gardens open daily from February to November – if you plan on visiting near the start or end of the season it’s best to check they are open in advance. Cost £5 per person, free to members of the Historic Houses Association. (2017 prices). Minterne House is not open to the public and can be hired as a wedding venue. 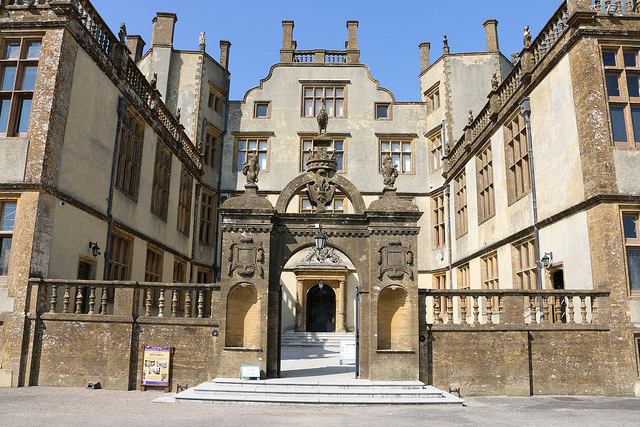 Sherborne Castle open April to October, closed Mondays and Friday, but it is open on Bank Holiday Mondays and Good Friday. Entry is free to members of the Historic Houses Association. There’s no charge to view the Cerne Abbas Giant, although you may want to make a donation to the National Trust. 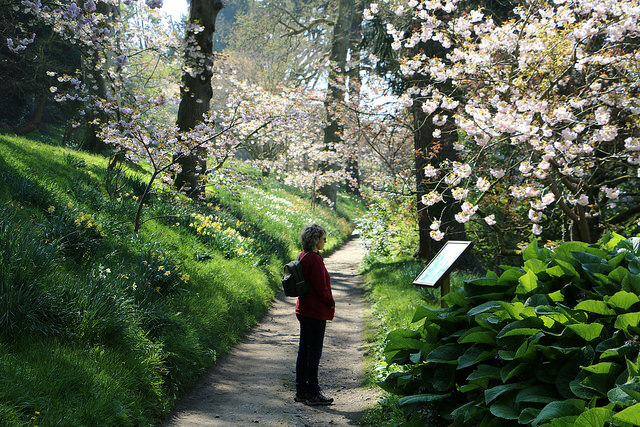 Minterne Gardens charge £6 per adult, while children under 12 get in for free. 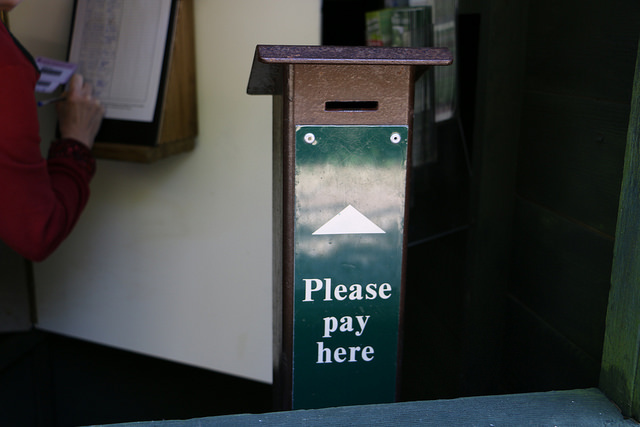 On quieter days they operate an honesty box system at the from gate. Members of the Historic Houses Association enjoy free entry and possibly also members of the Royal Horticultural Society – if you’re an RHS member check with your membership information. Click for more details. Sherborne Castle charge £12 for an adult to visit both the house and gardens. One adult can take in up to four children aged up to 15 for free. Members of the Historic Houses Association enjoy free entry. Click for detailed prices and opening times. There are toilets at Minterne Gardens and Sherborne Castle. You can look at the Cerne Abbas giant without leaving your car, although you’ll get a better view if you do. 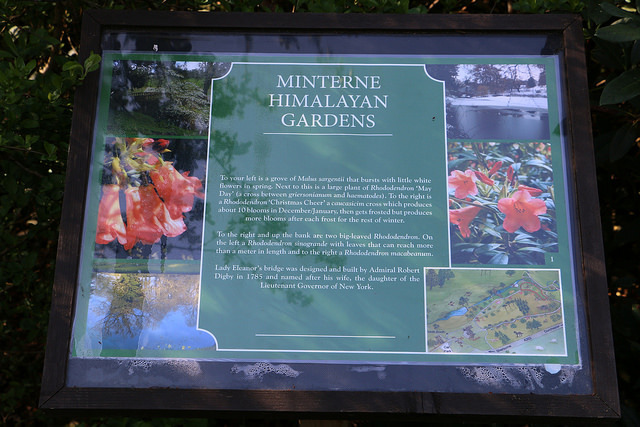 There’s about a quarter of a mile walk from the carpark to Minterne gardens. The footpaths at Minterne are unpaved and uneven in places, with some slopes. So they’re not good for wheelchairs and people with mobility issues. Parking at Sherborne Castle is within a very short distance from the house and facilities. The footpaths at Sherborne are varied, with paved areas around the house, cafe and shop. The house tour includes several flights of stairs. 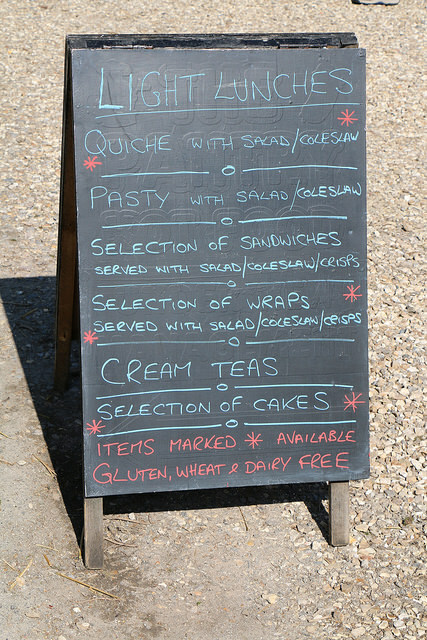 Sherborne Castle has a cafe, while Minterne Gardens can offer refreshments, weather permitting. Take the A354 from Weymouth to the A35 roundabout just outside Dorchester. Turn left onto the A35. Along this stretch of road enjoy views of grassy Maiden Castle (it’s an ancient hill fort). On your right you’ll see smart, clean buildings of Poundbury (a very modern development based on Georgian architecture). At the next roundabout take the third exit, the A37. This drops down to another roundabout, where you take the first exit, staying on the A37. Then take the next right, onto the A352 to Cerne Abbas and Sherborne. When you reach Cerne Abbas, drive through the village, following the A352. 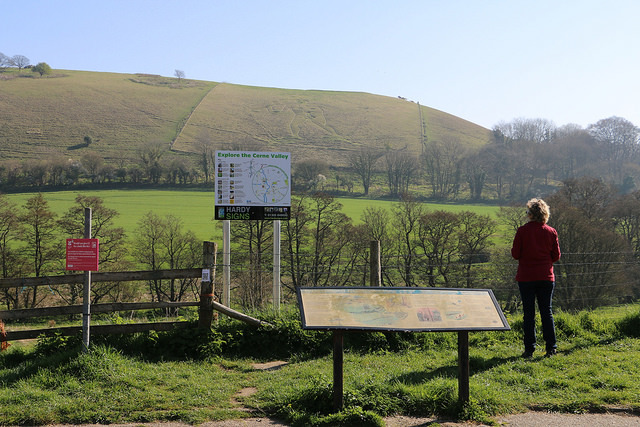 As you leave the village you’ll see the viewpoint for the Cerne Abbas Giant signtposted to the right. There’s a reasonably sized car park (no charge) at the viewpoint, along with a display board that explains about this curious figure made by cutting into the chalk hillside. There’s no doubt that the giant is old – but no one knows how old. Some suggest it’s perhistoric, while others believe it was made around the time of the English Civil War, to mock Oliver Cromwell. The giant gets his first mention in documents written after the Civil War, and does not appear in a detailed survey of the area made thirty years before the war. Learn more from Wikipedia. The Giant must be at least 360 years old, a respectable age that qualifies him to be listed as an ancient monument. His appearance, however, is less respectable, being entirely naked. The earliest drawing of the figure, from 1764, shows him as he is today, but the Victorians altered their illustrations of him, to remove his obvious masculinity. Don’t expect to climb onto the hillside occupied by the giant. The viewpoint allows you to see him in all his splendour, but there’s no access to the figure himself. Walking on the hillside, and the figure, will damage it. 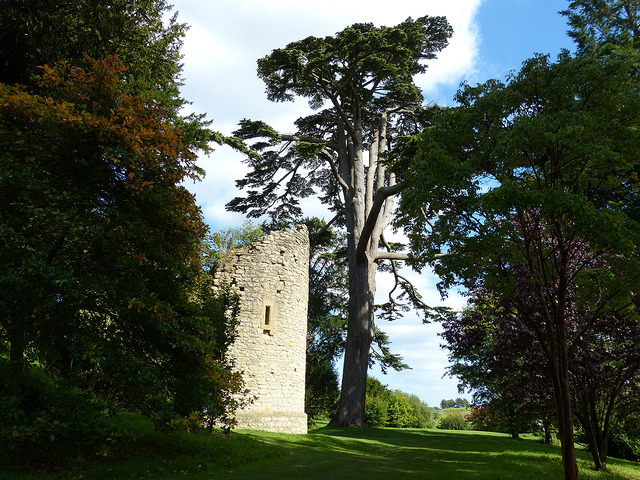 It doesn’t take long to admire the giant and once you’re done, it’s time to move on to Minterne Gardens. Return to the A352 that runs past the viewpoint carpark. Within a few minutes you’ll reach Minterne Magna. As you follow the road to the left in the village, you’ll pass the gates to Minterne on your right, and immediately after, you’ll see a church. The car park (no charge) is immediately opposite the church. It’s not huge, although you can overflow onto the grassy area behind it. The gardens are described as Himalayan and occupy a hillside and valley, including a small river. They are famous for their rhododrendrons and azaleas, which along with spring bulbs make for a delightful display of colour early in the year. I visited in early April, just as the daffodils were fading (but still looked good from a distance) and many of the rhododrendron trees were in full bloom. You’ll be directed on a circular route around the gardens, that gently drops down into the valley. Here you’ll discover a small river with a number of small cascades dating back around 250 years, to when the gardens were laid out. A number of information boards around the route highlight particular plants. I not that interested in the details of specific plants, so I didn’t stop to read most of these, but I’m sure many garden lovers will find them interesting. Towards the end of the route there’s a particularly picturesque Georgian stone bridge across the river. The footpath around the garden is about one mile long and you’ll probably spend between 45 minutes and a couple of hours in the gardens, depending on how interesting you find them. Turn left out of the carpark opposite the church and leave Minterne Magna on the A352. In a little over 15 minutes you’ll approach Sherborne, but before you get to the town, turn right onto the B3145. Follow this, keeping Sherborne on your left, until you see the entrance to Sherborne Castle ahead of you, as the road veers off to the left. I need to mention there are two Sherborne castles. You’re about the visit the ‘new’ castle, which is the house built by Sir Walter Raleigh. It’s close to the old medieval castle, now a ruin managed by English Heritage. The full Sherborne Castle experience includes a tour of the house, a gift shop, cafe, lake and gardens, all set in a landscape designed over 250 years ago by the famous garden designer Capability Brown. The house includes a gothic-style Georgian library (reminiscent of Strawberry Hill in London), some reception rooms, bedrooms and a heart of the original Tudor house. Built by Sir Walter Raleigh, the building has been extended from his original design. It is still a family home, occupied by the Digby family who took it over when Raleigh fell from favour. They’ve been in residence since 1617. Items on display include paintings by Joshua Reynolds, plenty of early Georgian china and the remains of the pipe Raleigh used to smoke the tobacco he brought back from his travels. Sherborne is probably one of the first places in England where tobacco was smoked, and the gardens contain the seat where Raleign supposedly had water poured over him by a servant, who feared that his master was on fire! 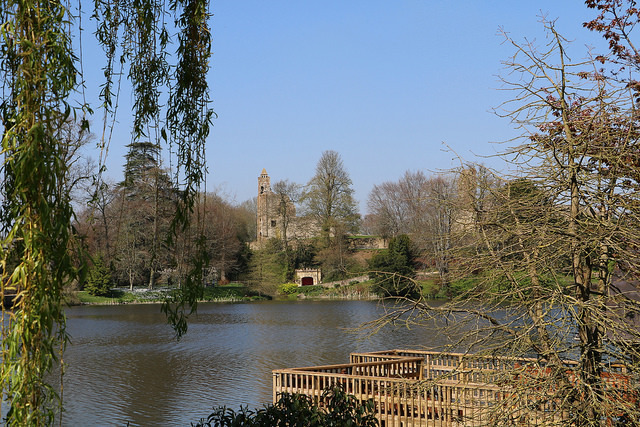 The gardens around the house offer wonderful views across the lake, with the old castle as a backdrop. 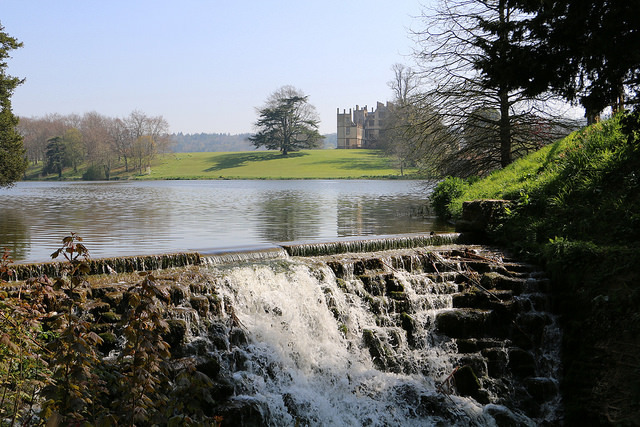 It’s an outstanding example of Capability Brown’s work, where the Dorset landscape and the medieval castle ruins have been shaped into a masterpiece of living art. There’s plenty of space to picnic at Sherborne Castle, and for children to run around. Just take care beside the lake! The journey back to Weymouth will take about 45 minutes. Retrace your route from Sherborne Castle, following the B3145 and then the A352. However, within 15 minutes of leaving Sherborne Castle you’ll approach a fork, where the A352 swings right and a slightly smaller road is on the left. You can take either route, with the A352 going back through Minterne Magna and Cerne Abbas, while the smaller road takes a higher and slightly more direct path, with some excellent views over Dorset countryside. Weymouth and the surrounding area are blessed with several viewpoints where you can drink in a panoramic perspective for free. If you’re looking for somewhere to pause for lunch or a coffee, or to include in a walk around the area, I’ve put together a list of the best. Rocks, sea and sky. The Jurassic Coast fuses these three fundamental elements in so many different ways, perhaps nowhere more spectacularly than at Lulworth. I took a trip to Lulworth just after the August Bank Holiday, to remind myself of what’s there. If, like me, you prefer your seaside served windswept and empty, I recommend a very off-season visit. Summer fills Lulworth with coach parties and crowds, many of them dropping in to tick off having seen another UK landmark. What is there to see and do at Lulworth Cove and Durdle Door? I’ll do my best to explain.